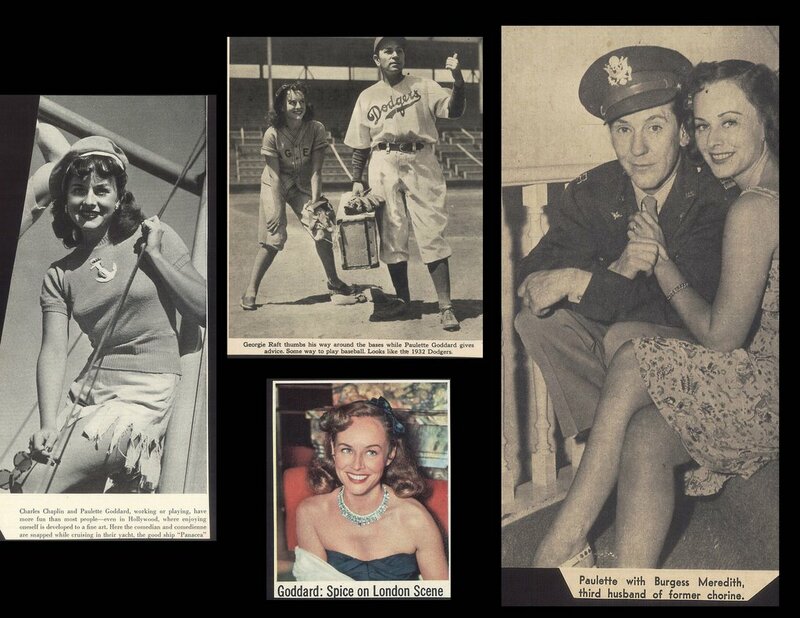 I’ve really grown to admire these scrapbook-keepers, without knowing, of course, who they were, or how and why they dedicated themselves to a particular actor or actress. I just admire the effort, energy, and creativity they poured into these collections. The sheer longevity of some is a wonder to behold. 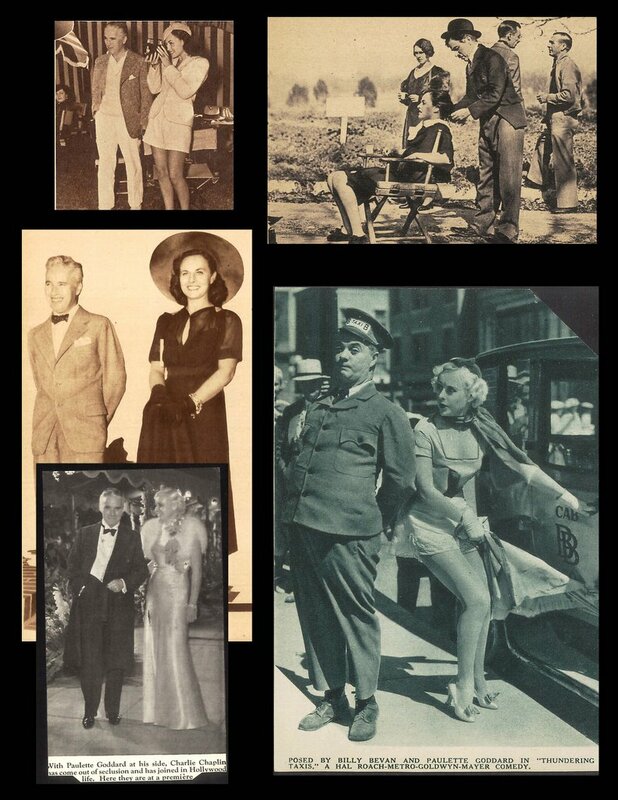 One set of albums on Bette Davis covered a span of twenty years, while another on Clark Gable filled five volumes over a period from 1948 through his death in 1960 and even beyond to the birth of his son, plus the childhood of same! That’s real dedication, and my only regret is fact I can’t pay proper tribute to these nameless chroniclers of old Hollywood and its luminaries. One remarkable thing about these clippings is rarity of the images. 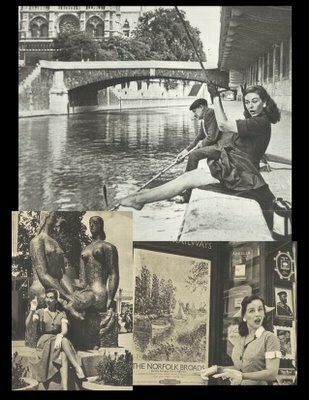 Most of the original stills and negatives are long gone, so it’s a thrill to come across unique poses amidst hundreds of cut-outs that make up these scrapbooks. 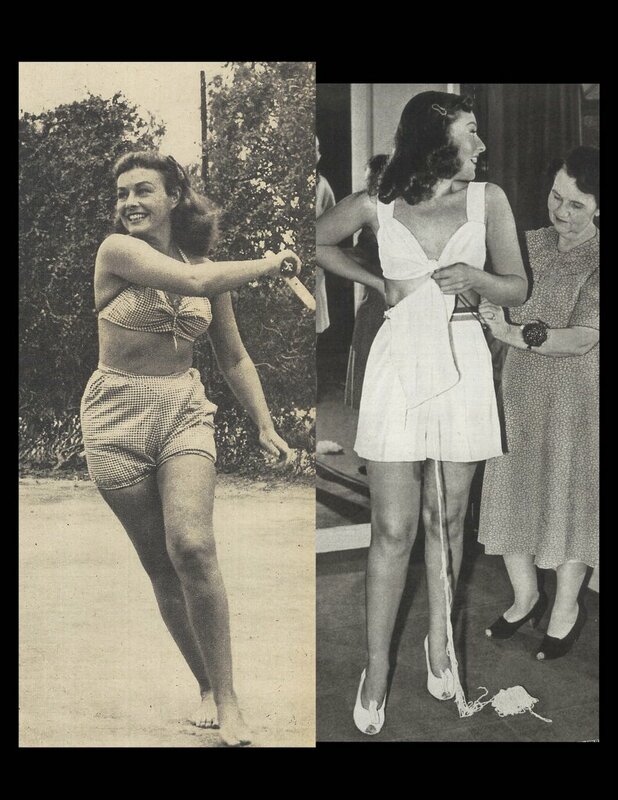 You can always expect the unexpected with this kind of material, and today’s sampling with Paulette Goddard is no exception. Once again, as with Clara Bow, I’ve utilized Photoshop to gather the best of this stuff for presentation here, and believe me, it’s hard to choose favorites among so many great shots. Paulette Goddard is said to have been the most bewitching woman in movies. Off-screen, that is. Like Scarlett O’Hara (a part she very nearly played), Paulette gathered up all the hearts in movieland, but the abiding mystery among all her admirers was just how and why that magic always seemed to elude her on the screen. If this woman’s movie career had approached her success in private life, she’d have been the biggest name in pictures . As things turned out, she was a short-term star, later to become a long-term footnote, as one of Charlie Chaplin’s wives. You could even add a question mark to the footnote, as there’s never been positive verification that the two were actually married, although they did live together throughout most of the 1930’s (a major reason PG lost Scarlett). Men used to fling jewels and furs at her --- she must have been incredibly good where it counts, if youse knows what I mean. Paulette had quite a line in feminine wiles. She put a rope around Chaplin, George Gershwin, H.G. Wells (! ), Clark Gable (not enough of a free spender to suit her), Burgess Meredith (one of the husbands), and All Quiet On The Western Front author Erich Maria Remarque, her final husband. All of them fell under that spell to accompaniment of emptied purses. Even Chaplin, the most notorious skinflint in town, made a generous settlement on her when their party ended. My impression of Paulette was that she could be a lot of fun as long as things went her way (like most of us, I guess), but when the grass looked greener on a neighboring continent, off she went. One time during the marriage to Burgess, they decided to invite friends over for an upstate New York farm dinner. Paulette served fresh-killed piglet to guests, the time-honored apple in its mouth, just like in movies. When hubby got home, late for the meal, he was greeted by the sight of his beloved pet swine, carved up and half-eaten by revelers. They say the marriage pretty much ended there. This first Paulette montage gives us several glimpses of she and Chaplin, plus the only actual still I’ve seen from one of Paulette’s early Hal Roach comedy appearances (she’s often credited with a bit in Laurel and Hardy’s 1929 Berth Marks, but I’ve not spotted her, despite careful examination). There’s also typical globetrotting cheesecake stuff she did for various magazine layouts in 1951. By that time, PG's movie career was really on skids, and her fame rested on repute as an international jet setter and heartbreaker. Even into the seventies, Paulette was still mowin’ em’ down. As to her birthdate, there were at least five possibilities bandied about. Paulette really knew how to groove with times --- she was even a member of Andy Warhol’s crowd during a 70's disco era. What a life. This color shot with Balzac took off on Paulette’s legendary talent for harnessing various big-time intellectuals of the day. Later interviews with some of them revealed that it was the lady’s vivacity and oft-times impenetrable logic that attracted them. This last still is a Greenbriar favorite --- young and fresh Paulette with a banana in Modern Times. We fell in love with her after seeing that one in a theater back in 1972. Maybe some of her magic did make its way to the screen after all. 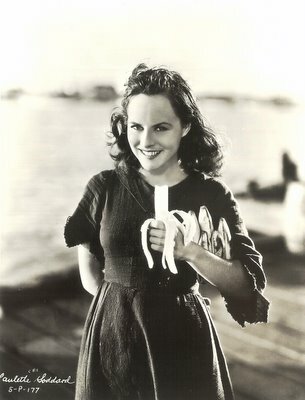 If yourself --or anyone --wonders what Paulette Goddard had ON-SCREEN,suggest you go back and look at a film called "The Women'--whatever "It" was, she had it! friking adore Paulette.she was magic .reminds me of me in many ways. She certainly did have "it".